After being up in the mountains skiing for a week, it's rough getting back into the daily grind. It's even worse when the Olympics--and your favorite winter events like skiing--are airing and you become as obsessed, or more, with watching the two weeks worth of winter sports as you get with the summer edition (skiing is my winter swimming). Add in work and what feels like a lot of catching up, and well, announcing the winner of the Fit-Kit was honestly the last thing on my mind. But enough whining about why I'm so late in hitting the publish button on this announcement. You'd think it'd be easy with a contest at hand, yet it took me all day (and a skipped workout) to wrap things up. Thanks for your patience! 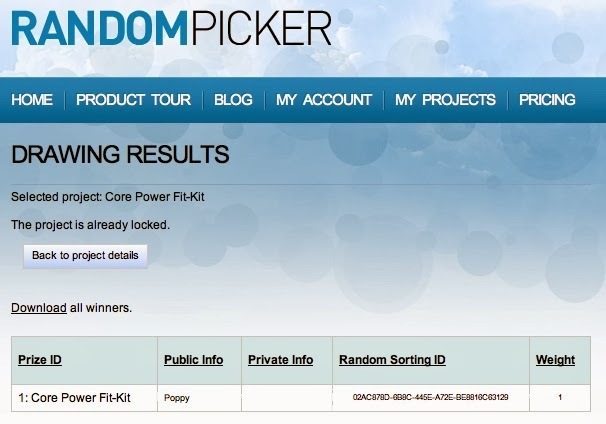 Random picker selected your name from the bunch to be the Fit-Kit recipient! To claim your prize, please message contact@fit-ink.com with your mailing address so I can have the Fit-Kit sent to you. Oh and I was warned to tell the winner to allow up to four weeks for delivery. Hope you don't mind waiting for this bag full of goodies--it's worth it though! Congratulations, Poppy K., and thanks to everyone who shared a comment, followed Fit-Ink on social media and entered to win! Seriously, I wish I had more than one of these to giveaway so there could be more Fit-Ink fans walking around with these Fit-Kits.